On the eighteenth of April, in Seventy Five…. Longfellow’s poem forever immortalized Paul Revere’s ride. 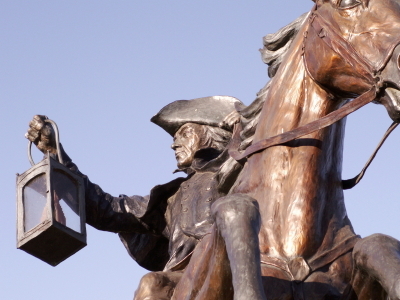 What the poem does not say is that Revere’s mission that night was to warn Samuel Adams and John Hancock that British soldiers were coming to Lexington to arrest them. It was after midnight, April 19th, when Revere arrived in Lexington and warned Adams and Hancock. Revere also aroused the country side, and that morning the “Minute Men” met the British regulars on Lexington green. No one knows who fired the first shot- “the shot heard around the world”. But on that morning, April 19, 1775, the American Revolution began. 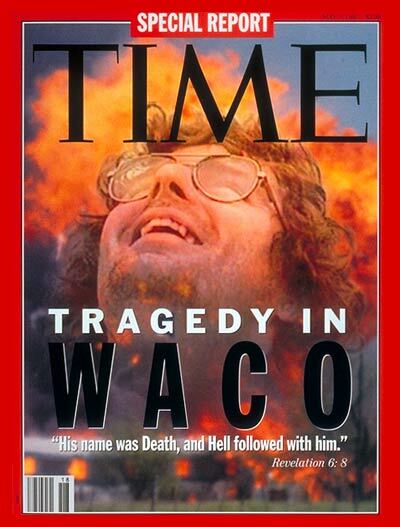 In a perverse twist of fate, on April 19, 1993, it is the 51st day of a siege at the Branch Davidian compound, also known as Mt Carmel, outside of Waco, Texas. It is to be the last day of the siege, a culmination of a series of bad decisions and missed opportunities. The siege began on February 28th. The Bureau of Alcohol, Tobacco and Firearms (ATF) had gone to the Davidian compound to execute search warrants. The warrants were based on affidavits stating the Davidians possessed certain illegal weapons to include fully automatic weapons and components to convert semi-automatic weapons into fully automatic. Some of the Davidians were known to have a propensity for violence including their leader, David Koresh, who had changed his name from Vernon Howell. There had been a power struggle a few years earlier within the Branch Davidians and a gun fight had ensued. The history of the Branch Davidians and how they ended up here, led by Koresh is a long story and won’t be told here. Suffice it to say, Koresh became the leader and subsequently claimed to be a messiah, who could procreate with any women followers irrespective of their age or marital status. The group embraced an apocalyptic philosophy, which relied heavily on the Book of Revelation. The ATF had been surveilling the compound for several weeks prior to the raid from a home across the road. They had also placed an undercover (UC) agent within the Davidians. However, the surveillance was compromised, and at some point Koresh learned of the UC agent. In addition one of the Davidians was the local postman. On the morning of the ATF raid, a TV crew asked the postman for directions to the compound as they had learned there was to be a raid. The postman gave them directions and took the news of the impending raid back to the compound. The ATF was aware of the Davidian’s potential for violence and obviously knew they had a large stockpile of firearms and ammunition. Consequently the element of surprise was an important aspect of their raid plan. However, surprise was an early casualty. ATF’s leadership was aware their plan had been compromised, but chose to proceed anyway. The ATF agents were met at the front door of the compound by Koresh and some of his “Mighty Men” (that’s how Koresh referred to his young male followers). There was a short stand-off . A shot or shots was fired. It has never been determined who fired the first shot-both sides claim it was the other. Whoever fired it, it escalated into a gun battle resulting in the deaths of four ATF agents (16 wounded) and six Davidians. Koresh was wounded along with several of his followers. Thus began the siege of the Branch Davidian compound. The FBI was given control of the siege. Negotiations between the Davidians and the FBI began and continued throughout the siege. Although the FBI was thrust into a situation not of its making, it learned valuable lessons. Unfortunately many of the lessons were learned from mistakes. Ultimately it became clear Koresh was not negotiating in good faith. Koresh had said that he would surrender, but he needed to finish his own scripture, something he called the “Seven Seals”. But surreptitiously placed microphones inside the compound had picked up conversations indicating that Koresh was stalling and did not intend to surrender. The FBI with concurrence of Attorney General Reno and President Clinton decided to pressure Koresh and his followers into surrender by punching holes into the compound walls and injecting tear gas. The conventional way to place tear gas is to fire projectiles containing tear gas into the target area. These projectiles explode on impact and expel tear gas, but this process also produces heat which can result in fire. The method devised for the compound entailed the use of converted tanks to spray the tear gas directly into the holes made in the walls. The error was not how the tear gas was injected, but rather underestimating the potential for mass suicide of an apocalyptic cult. The FBI was warned of this potential, but it was discounted- what person would choose suicide over surrender, not only for themselves, but for their children? Timothy McVeigh, the Oklahoma City bomber witnessed part of the siege. McVeigh was sympathetic with the Davidians and was outraged that the siege ended in the conflagration and death of Koresh and most of his followers. It’s not clear when McVeigh’s anti-government beliefs began, but those beliefs were growing and becoming an obsession. It’s difficult to encapsulate McVeigh’s philosophy. It was clearly anti-government and became virulently so. It was an amalgamation of white supremacy, anti-Semitism and fear of a “New World Order”, i.e., a belief in a world-wide conspiracy to take over the world and the US Government’s leadership being in league with this conspiracy. If there was an over-riding theme to McVeigh’s beliefs, it was probably his trying to replicate the plot of The Turner Diaries, a 1978 novel written by William Luther Piece (a white supremacist) under the pseudonym Andrew MacDonald. The book depicts a violent revolution in the US ignited by the bombing of the FBI headquarters, which leads to the overthrow of the US Government, nuclear war and ultimately to a race war resulting in the extermination of all Jews and non-whites. While in the military, McVeigh met Terry Nichols. They became friends and their friendship continued after they left the military. Nichols was a follower and embraced McVeigh’s philosophy and paranoia. After the Davidian compound siege ended, McVeigh began to develop a plan to destroy a Federal Building- an act of retaliation for what had occurred at Waco. Initially the plan was to destroy the building when it was unoccupied, but McVeigh decided he needed to send a stronger message and that would require people to die. Later McVeigh would say, “Kids and women are fair game”. 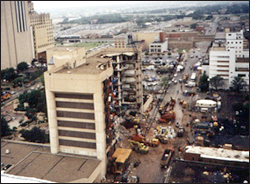 McVeigh and Nichols plan coalesced into the selection of the Alfred P. Murrah Federal Building in Oklahoma City as the target. The plan was to build a bomb and place it in the back of a truck. McVeigh and Nichols researched how to construct a large bomb and experimented with making and detonating explosives at the Nichols’ farm in Decker, Michigan. In April, 1995, McVeigh, using another name, rented a truck in Junction City, Kansas. McVeigh and Nichols had previously obtained and stored the components for the bomb. In a park outside of Junction City, they assembled the bomb in the back of the rental truck. The bomb consisted 13-55 gal. drums: 9 containing ammonium nitrate (fertilizer) and nitromethane (racing fuel); 4 had fertilizer and diesel fuel. Also with the drums was about 350 lbs of Tovex, a commercial explosive. TheTovex would act as primary or initiator. McVeigh ran 2 fuses from the cargo bay to the cab of the truck. The fuses were attached to blasting caps that would set off the Tovex. The bomb weighed about 4,800 lbs. and cost about $5,000. Prior to April 19th, Nichols and McVeigh drove to Oklahoma City and parked the getaway car several blocks from the Murrah Federal Building. They then drove back to Junction City. McVeigh stayed at a motel in Junction City. Although McVeigh used another name when he rented the truck, at the motel he used his true name with the Decker farm as his permanent address. On April 19th, McVeigh drove the bomb laden truck to Oklahoma City. A few blocks from the Federal Building, he lit one fuse. Then just prior to parking the truck at the Federal Building, he lit the back-up fuse. He exited the truck and ran the few blocks to the getaway car. When the bomb exploded, it did so with the force of 5,000 lbs of TNT. It destroyed the Federal Building and killed 168 people and injured over 700. It also damaged or destroyed 324 other buildings. Among the fatalities were children as the Federal Building housed a child care center on the street level. McVeigh had known of the child care center. Within hours the FBI had identified the rental truck (from the VIN on an axle that had been blown some distance from the site) and knew it had been rented in Junction City. Agents dispatched to Junction City discovered the truck was rented under a false name, but the same person used a different name, Timothy McVeigh, at a nearby motel. A BOL (BE On The Lookout) bulletin was broadcast, and it was learned McVeigh had been arrested by the Oklahoma State Police driving a car without a license plate. An alert trooper also saw that McVeigh was carrying a concealed handgun. McVeigh was about to be released, but a hold was placed, and FBI agents took him into custody. Two days later, the FBI went to the Decker farm to execute search warrants. The Detroit FBI SWAT team was sent in first to secure the farm as there was a concern about armed co-conspirators (The extent of the conspiracy was not yet known.) and explosives at the farm. I was one of the SWAT team leaders involved. The farm was operated by James Nichols, Terry’s brother. It was known James had anti-government sentiments, but there was never sufficient evidence to prosecute him for being involved in the conspiracy. The search of the farm did find bomb making materials and evidence bombs had been tested there. McVeigh had picked April 19th for the bombing because it was second anniversary of the end of the siege at the Davidian compound. It also happened to be the 220th anniversary of that shot heard around the world. When McVeigh was arrested he had a quote from Samuel Adams (one of the men Paul Revere was sent to warn): “When the government fears the people, there is liberty. When the people fear the government, there is tyranny.” Underneath McVeigh had scrawled, “Maybe now there will be liberty.” McVeigh also had pages from the Turner Diaries, the racist/anti-Semitic diatribe masquerading as a novel. It dishonors our founding fathers when McVeigh and some militias try to cloak themselves in the legitimacy of the men who valiantly fought for our independence and at the same time embrace the ideology of the white supremacy movement. It is perverse to equate what our founding fathers did and endured to establish a Constitutional government with the bombing of a Federal building- killing 168 people, whose only crime was being in or near that building. The lesson that was learned on April 19, 1995, was that we in law enforcement or as citizens have to take the anti-government movements seriously. Their ideology may seem foolish, historically and theologically spurious, but that does not diminish their potential for harm. 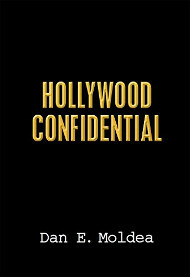 This column was previously published in ticklethewire.com. Posted: 4/2/13 at 8:42 AM under FBI, News Story.